Kia Spectra Pros and Cons | Page 1 of 1 | Why Not This Car? What drives people to buy (or not buy) a certain car? 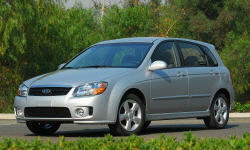 TrueDelta's members share Kia Spectra pros and cons based on their real-world driving experiences. When I first bought the car the 138HP seemed like plenty, but there is a deadband near 4000RPM & the little engine just has NO torque. Four wheel discs, ABS and secure handling for accident avoidance. A strong well-designed body structure and many airbags for occupant protection. Similar packaging and performance to the Mazda Protege5 at a better price. The Spectra SX has a firm, sport-tuned suspension & tight steering that makes it responsive and fun to drive for an economy car. Very comfortable for prolonged around-town driving, not bad for long trips. Could use adjustable lumbar support, but all other adjustments are very good. The non-sueded cloth is comfortable and durable. Have owned a used 2006 stick and liked it. Wife wanted our 2nd car to have an automatic. First tank of gas was 25 mpg all in town driving. Not bad.